Top Five Club Scores as of July 17, 2011. Complete results here. 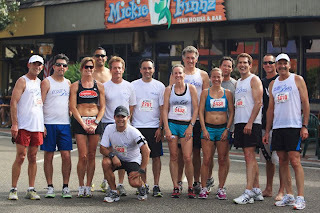 With the rest of the city seeing 100+ temps, the cool place to be was Redondo Beach on the 4th of July…for the 18th running of the Village Runner 5K. Lots of locals, as well as many from outside the area (even out of state) went to the starting line on an alternating overcast/sunny warm morning. David Cardona, fresh off a recent tear at the State JC championships, was first to finish in 15:19 (4:57 pace), and Alison Kielty (formerly Torrance High and ASU) took the Women’s crown in 17:17 (5:35 pace). The Club Ed contingent was large (37+ runners), competitive (28 Top Ten age group finishers), and successful (no injuries, I hope!). The Club men’s contingent was led by Mike Sevier (4th overall, 16:06, 5:12 pace), showing he is fast becoming a serious runner. Our talented and speedy women were led in by Nathalie Higley (27th OA, 17:47, 5:44 pace), as she works her way back into the local competitive racing scene. Assorted race highlights: lots of Club Ed racing jerseys in the race (nice to see them out there! ); a steady stream of Club Ed racers in the pack (another great motivator to work up through the pack); an aggressive Nathalie Higley, holding her ground as she was cut off in the first turn; encouraging words along the route by Club Ed teammates (both on the sidelines and in the racepack); Tamar doing the GI Joe Pushup Challenge (you go girl! ); a competitive return for former El Camino runner Juan Fabian, in his new Club Ed singlet; Kristin Cooley jogging through the 5K, recovering from her 2nd consecutive Comrades’ Marathon in South Africa (8:47, run in the uphill direction this year! ); Sharon Lotesto trying to give Coach Ed a post-race fruit roll-up treat, because she didn’t want to eat the extra 50 calories; a pack of Club Ed runners on a cool-down loop of the course post-race(nice! ).